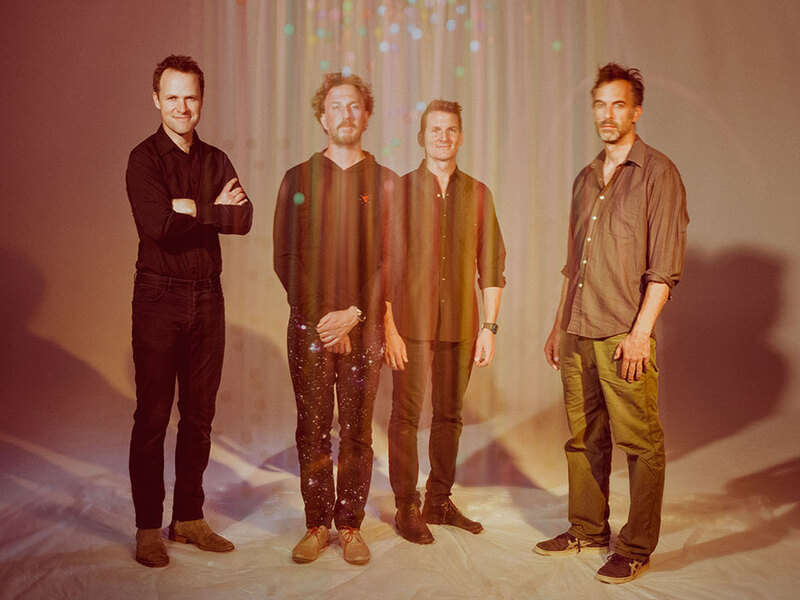 Guster is releasing its highly anticipated latest album, Look Alive, a nine-track collection. The first record released in four years, it features an intense emotional sound showcasing dark synths and powerful striking keyboards. Producer Leo Abrahams aided the band in adopting a colder style than their previous work, resulting in the record’s deeper, moodier tone. Chloe Robinson had the chance to interview the band, discovering how their music has evolved and how the band formed. Q: What was it like recording your first record in four years? How has your music evolved since your previous album Evermotion? A: Every record sometimes has a minor or major twist. Evermotion is pretty radical. We are very often influenced by the producers that we work with. We try to write really strong songs and find collaborators that can bring out the best in those songs. Evermotion was with Richard Swift who died recently. He was a huge influence on how that record turned out and how we recorded it. It’s very seat of your pants. We figured it out live and Leo Abrahams, who we made most of this record with, is the opposite. He is very fastidious. He’s very tight and focuses on the super little details, and the album kind of reveals a lot of that. Texturally and vibe-wise I think it’s completely different. Swift was our more stoner-y record, this one also hopefully feels stoner-y, but in a different way. Q: What was the writing process like for ‘Look Alive’, and what was the inspiration behind its highly emotive sound? A: We all live in four different states at this point. There’s a lot of things going on extra curricularly outside of the band. We’d meet up for a week or two kind of all over the country. It’s usually at the end of a tour, or I’ll say my buddy has a rehearsal space in Denver so let’s all just meet there and we’ll do a writing session. We did that for a couple years and we collected 20 songs, then paired it down. We would figure out what we wanted and I would really dig into the lyrics, and that was another part of it. That’s kind of how we do it. There’s no real practical way for us to do this, everything is vaguely impractical because we live so far away from each other. We have families and we’re middle-age men. But we really like that way of writing. If you’re still playing a song a year and a half later and you still like it, that’s a very good indicator. We make records infrequently, maybe every three or four years. We make records that will last awhile, ones that are more in the classic vain and less sort of extemporaneous. That process serves us in a way to say, that was a cool idea, but it’s not really cool anymore. Like I said if something feels good a year or two after you’ve written it, it’s probably a good indication it’s going to work. A: I understand the record was primarily recorded with Leo Abrahams (Regina Spektor, David Byrne) at the vintage keyboard museum in Calgary. Can you tell me more about what that experience was like? A: Yeah we made the record with Leo in a few places. We did the first two weeks — which were the most critical in a way because it was the first time we’d worked together — at the National Museum in Calgary. We were initially supposed to go to Texas, but Leo informed us two weeks before that we couldn’t get a US visa. So we had to go somewhere in Canada and this place popped up — and it was amazing. It ended up just giving us a lot of textures and colors to play with that we were already kind of leaning towards. It’s not like we got there and thought, hey let’s think about using keyboards. A lot of the stuff that we had been working on for a couple of years were using synthesizers and mellotrons and other textures. It gave us the vocabulary to make the record in that sense. We went to Montreal and did the same thing. By the time we went to New York with Leo we were already dialed in. Leo’s very fastidious and detail oriented. He’s using a program called Ableton. It’s almost molecular in its approach. There’s a lot of very tiny parts implemented in these songs. It has a lot to do with Leo’s approach. It suited his production style. It was a joy to have this playland to rope around in. Inevitably we didn’t end up using that many things. One of the biggest influences was this 80s keyboard called the Mirage that cost 150 bucks and that’s not very in fashion, but it ended up being the sound of a lot of the record. Q: How was Guster formed and what was the inspiration behind the band’s name? A: I can’t really answer the name question, but we all met at Tufts University when we were in college, which was in 1991. The unifying factor was I had been in a band that wrote original music. I didn’t want to jam and be in a cover band. We were about writing songs from the very first moment. It carried us through oddly enough. Q: Lastly, what can we expect in the future from Guster? A: We are putting out a new record this week. We are very excited about putting out our new songs. People have spent a long time with our music. There are grown men and women coming up to me saying, I’ve listened to you since I was a kid. Having been around for this long we’ve been a part of a lot of people’s lives. I think we are really humbled and honored by that. The reason we are still a band is because we try hard to not play into the nostalgia thing. But we understand the importance of our music to a lot of people and it’s really important to us. Everything is brand new for us in a lot of ways. We are using a lot of new gear. We are constantly trying to be a better version of what we were before. Hopefully people can expect a better version of what we were. That’s our hope at least.